Interestingly, and an important note for all consumers to consider and take heed of when buying motor oil, the complaint sites the very words of the Vice President of Amalie in an interview in 2003 as evidence that the company knows what it is selling (“cancer”), and why (profit). Although the lawsuit is specific to products sold in Florida, the Petroleum Quality Institute of America (PQIA) cautions consumers that it has observed this product in a number of other states and issued alerts about them. Adding to this, PQIA advises that Amalie is not alone in selling API SA and other motor oils meeting only obsolete specifications. In fact, unfortunately, it is not uncommon that PQIA observes other brands on the shelves that only meet obsolete specifications. Further, it can be difficult for consumers to distinguish these products from motor oils meeting current specifications considering the front labels often project a modern stylized look and include language suggestive of a quality product. With that, consumers are advised to always read both the front and back labels on the bottles and look for the API Service Category. Click for API Service Category timeline. Whereas PQIA brought the Amalie XCEL (API SA) issue to the attention of the Chief, Bureau of Standards Division of Consumer Services Florida, Department of Agriculture and Consumer Services several times in 2015, the XCEL Premium motor oil brand meeting only an API SA Service Category continues to populate retail shelves in Florida and elsewhere, and is also sold online. In addition to the fact that it only meets an obsolete specification, PQIA also advised the state of Florida that an API SA oil cannot be a multi-viscosity product (as implied by the XCEL label) since and SA does not contain additives. But until the state of Florida takes action, PQIA cautions consumers to be aware that obsolete motor oils that can or have the potential to harm engines are still in the market and unfortunately not hard to find. To avoid them, READ THE LABELS. 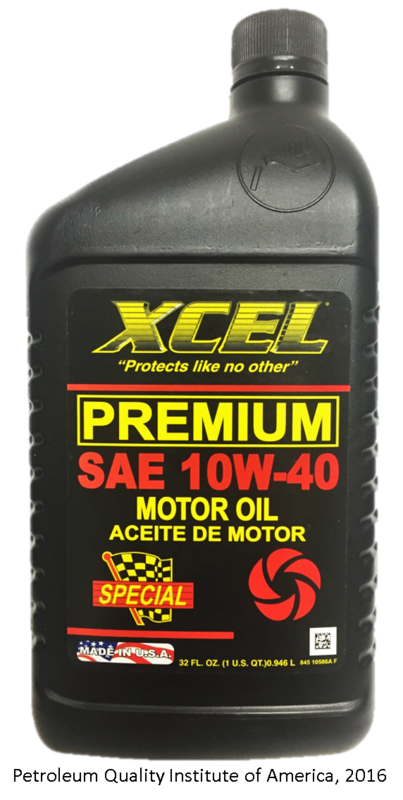 XCEL Premium Motor Oil SAE 10W-40 API SA, SB in Washington, D.C.
XCEL Premium Motor Oil SAE 10W-30 API SA, SB in Washington, D.C.